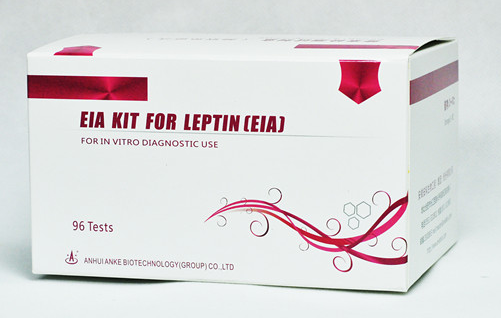 This product consists of microwell plate which is coating of purified anti-leptin, enzyme-labeled anti-Leptin, quantificational leptin and some other reagents. According on the principle of double antibody sandwich method (ELISA),this product can detect the leptin in human serum, blood plasma and other samples. Dark at 2~8ºC, keep dry for 6 months. (1) Pipette 100ul of the serum sample and 100ul of quantificational leptin of each density to each well of the microtiter plate, and double-pored , incubate at 37℃ for 1 hour. (2) Remove the above solution, wash three times with washing buffer and clap it to dry. Add 100ul of the enzyme labelled antibody solution to each well, incubate at 37℃ for 1 hour. (3) Remove the above solution, wash five times with washing buffer and clap it to dry. Add one drop of each chromogenic solution A and B to each well, keep away from light for 10 minutes. (4) Add one drop of stop solution to each well , misce bene.Take it into the microtiter plate reader equipped with a 450nm filter to determine the optical density value of each well. Draw a standard response curve on coordinate paper with optical density value of the quantificational leptin as the ordinate and the density of the quantificational leptin as the abscissa. To find out the density of the leptin in the samples. Range of the curve: 0-50ng/ml. With the sanmples above the range, dilute them to appropriate density before re-testing. (2) Forbid to use the different batch number of the kits.